Joe wouldn’t bet on center Ryan Jensen being on the Bucs in 2020. That’s just salary cap reality when you look at the Tampa Bay offensive line, as well as Jensen being older than Ali Marpet and Donovan Smith, and how Jensen performed last year. 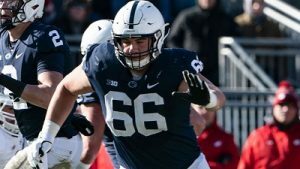 Combine that with the Bucs’ urgent need for a quality starting right guard, and enter Penn State mauler Connor McGovern. He’s a rather unique prospect because he excelled at guard and center in college, and he’s not undersized at 6-5, 308 pounds. He played close to 320 last season. McGovern, largely viewed as a second-round pick, seems like such a Jason Licht kind of pick. Penn State? Check. Versatile? Check. Allegedly nasty? Check. The scouts seem to like that McGovern has real NFL strength. NFL Network draft guru Charles Davis was crowing recently on SiriusXM NFL Radio about McGovern as a “strong, aggressive, beat-you-up-in-a-phone-booth” guy. Also throw in that Bruce Arians’ son Jake was talking on his podcast months ago about how you draft starting guards in Round 2. That’s significant to Joe because it seems Jake Arians often parrots his dad’s philosophies and thoughts. Joe would be pleased to see the Bucs draft a guy like McGovern in Round 2. It’s a fit for a team that’s probably going to win via its offense for at least a year or two. RT we have Dotson who has been average or better when healthy plus Cappa/Benecoch behind him and Benecoch was solid at RT vs RG. Cappa’s body frame makes me think OT not OG. Get a pure plug and play OG please and stop f*cking around with these experiments and hopeful developmental guys. I was on board until I read the words “largely viewed as a second round pick” + “seems like a Jason Licht kind of pick” = disaster. Joe, any chance the Glazers ask Jason to pick up some donuts then change the locks on the War Room on day 2? As excited as I am to see the next RoJo/Aguayo/Spence/ASJ I’d really prefer the Bucs add a future starter at the top of Rd 2 and not a trivia question as to who is the worst NFL kicker of all time. That would be a heck of a pick. 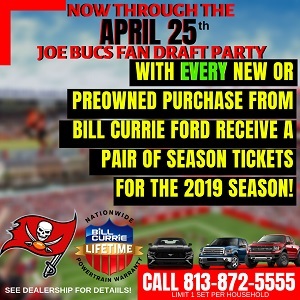 That’s a great mention, I’m ashamed I haven’t given this player for the Bucs more thought. • *Cody Ford – G/T, Oklahoma | Height: 6-5. Weight: 301. • Connor McGovern -G/C, Penn State | Height: 6-5. Weight: 301. • *Bobby Evans – LT, Oklahoma | Height: 6-5. Weight: 301. • *Isaiah Prince – RT, Ohio State | Height: 6-6. Weight: 306. • Tytus Howard – OT, Alabama State | Height: 6-6. Weight: 306. Cont… Elgton Jenkins G/C Miss. St, | Height: 6-4. Weight: 301. !!! Jensen is definitely overpaid but I don’t think he performed poorly last year. He needs to cut down on idiotic penalties. Without those he is a solid center. Would love either pick in that 2nd round spot. We need to improve the trenches! Trade back with the #5 pick to get some extra 2md or 3rd round picks. There’s some real gold in those rounds. Haven’t checked out many mock lately; so thanks for the update. Everything that I’ve heard about the mental make-up, and practice habits. Leads me to believe – he would be a perfect fit for the BUCS. I lost a lot of LUV for Bradberry during the Senior Bowl. He was easily overpowered by almost everyone he faced. He moves well and has quick feet, so he probably is better suited for a zone-based scheme. But for power based or even combination schemes. He just doesn’t have the upper body strength or leverage to hold the point of attack. Good to know. I think he’ll go R1 so probably won’t be an option. I just know he tested really well. Easterling gifted us DT Ed Oliver, G Chris Lindstrom, and DE Jachai Polite in the 3rd. Wouldn’t mind that at all. Absolutely on board with drafting the best inside OL player we can get our hands on with the high 2nd rd pick. Yea – that’s exactly what we need. In my opinion it would be nice “IF” we could trade back into the bottom of the 1st Rnd. (packaging Mc93 or next years draft capital ) To make sure we get the OL that we need and also locking him down for the extra year because he would be a 1st Rnd pick. This would help the cap in the future with the high priced OL that we already have. those 3 would be perfect for our 1st 3 picks…..
To be fair to Caleb… the OL more than any other position/unit must all pleas one and the Ol has been a mess forever! The draft network has him listed as a 4 round value. Walter football has him going 3-5 round. He ranked 5-7 best G/C in most rankings. A high 2nd for this guy is just not good value. There will be better players in needed positions available for the Bucs at two. If he’s still available in the 3rd or 4th round pick is a different story. Ah, these Bucs under Licht aren’t thinkng 2020. He is thinking about his own arse and how he can draft now to make it look like he’s planning for 2020. I think Jason will draft a RG but I think that’s it. If the Bucs were a winning team thinkng forward more than a year, I’d agree…look at a Center. Geeze, that is sad to say. I think you wait until round 3 for a guard unless you have a 1st round grade on a guard that drops to us early in round 2. Chances are that a guy that we have a 1st round grade on at another position will drop to us in the 2nd. I would double up on defensive front 7 players. Joe, don’t underestimate Todd Bowles and his influence on a defense. He’s a really smart coach. Except for the fact that he’s projected by just about everyone as going in round 3 at the earliest. I’d rather have Chris Linstrom, eric McCoy, or Michael Dieter over this guy. So the Bucs are already conceding that Cappa was another bust?